Sit was Toby’s first trick. Toby knows the commands for sit, high five, jump through a hoop and even bed. He learned those tricks because he was so food motivated he would follow treats and figure out what he needed to do to earn his tasty reward. Sit was his first “trick” and I started teaching it to him mainly because I was learning how to teach tricks to dogs at the shelter and wanted to see if I could teach the same trick to my cat. After sit, we progressed to “high five” and even jumping through a hoop. Toby seems to enjoy learning the tricks and performing them. He’ll sometimes throw them out in hopes of getting a treat. Just the other day my boyfriend paused to pet Toby. My boyfriend was holding a glass of milk in his other hand and Toby began earnestly high fiving my boyfriend in hopes of getting a sip. He got a tarter-control treat instead. Teaching Toby tricks has been a lot of fun and I don’t want to stop working with him. I think the next trick I’ll teach Toby is to come when he’s called. I think that the tips in Petfinder’s “Teaching Your Cat to Come When Called” video should help! 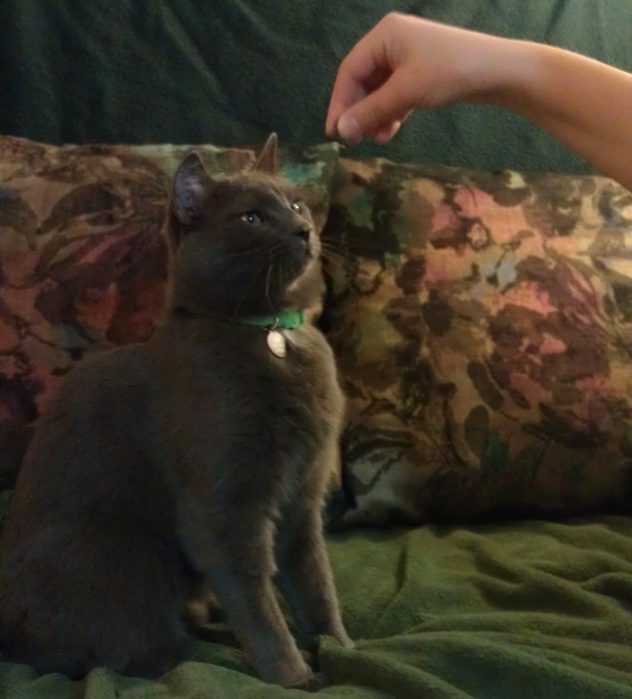 Tell us: What “dog” trick would you love to teach a cat?